Originally used as a term for the British islands when they were a province of the Roman Empire, Britannia is still a well-known name to date. Honoring this name, the Britannia Gold coin was first released in 1987 by the Royal Mint. This 2017 release marks its 30th anniversary and is bound to be an integral part of any Gold coin collection featuring Britannia Coins. Each of these coins has contained 1 troy ounce of pure 0.9999 Gold. Moreover, their Brilliant Uncirculated condition ensures that they have the luster and finish of freshly struck Gold coins. A radial sunburst design protects these coins from forgery and makes sure that each gold coin you purchase is an authentic product of the Royal Mint. In addition to this, each of these Gold coins is considered legal tender in the United Kingdom, with a face value of 100 pounds, backed by the Government. The obverse of the coin portrays the latest image of Queen Elizabeth II, created by Jody Clark in 2015. Moreover, she is the youngest engraver to have the honor of completing Her Majesty’s portrait for currency in England. An instantly recognizable figure of Britannia is featured on the reverse of these coins. She is shown battling a storm and standing firm against it, symbolizing the strength and grit of the great nation of Britain. 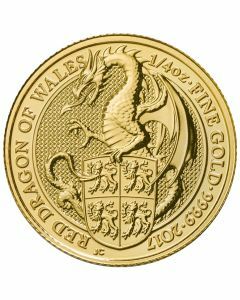 Official backing by the United Kingdom government makes this Gold coin a healthy investment choice for investors who wish to diversify their Gold portfolios with some quality Gold while obtaining an iconic design at the same time. 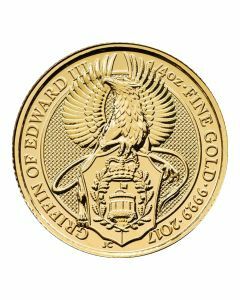 Considering that this is the 30th anniversary of the Britannia Gold coin’s release, this particular coin release is bound to be a particularly popular investment option among investors around the world.